NASCAR Thunderâ„¢ 2003 surrounds you with the emotion, sound, fury, and risks of the high-speed, high-drama career of a NASCARÂ® star. Feel the adrenaline rush, intensity, and passion of being a NASCAR driver on a quest to become a NASCAR Winston Cup Series champion. Take on various real-life scenarios, complete with dramatic pileups, walls of smoke, and constant door -to-door, three-wide racing, to test your nerve and improve your racing skills. Build a racing legacy over the course of 20 drama-filled seasons. A totally new gaming engine delivers better game play through improved physics, AI and control. While new graphics rendering technology allows spectacular car and track highlights, enhanced smoke and damage, and even more dynamic racing venues. NFL Street features fast-paced, 7-on-7 gameplay where players use stylin' moves, pitches, and brute force to power their way down the field. Players include over 350 of the NFL's biggest stars from all 32 teams including legends like William "The Ref..
NCAA Football 2005 is taking another huge step towards differentiating the game of college football from pro football thanks to the inclusion of the new Home Field Advantage feature and a slew of tweaks geared towards the presentation, players perfor.. Your quest for the Heisman Trophy begins with NCAAÂ® Football 06. Create an Impact Player and lead him from high school summer camp all the way to bowl victories as a collegiate legend. As your blue chipper improves on the field, he becomes a big man..
NASCAR Thunder 2004 puts gamers behind the wheel in a world where grudges and alliances mean the difference between victory lane and disaster. You're no longer just racing a track, you're racing a pack of 42 real world stars who think for themselves,.. 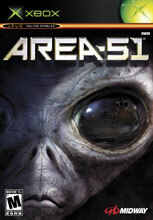 The U.S. Army has received a distress signal from Area 51 where a viral outbreak has just shut down the research facility. A small Hazardous Materials unit led by specialist Ethan Cole is sent to inve..